Kagano Hachiman Shrine (加賀野八幡神社) is located in Ogaki, Gifu prefecture. It is very popular for its spring water. It is chosen as 100 Heisei best water in Japan and 50 best water in Gifu. Many people visit here to gather its tasty water for their daily water for cooking. 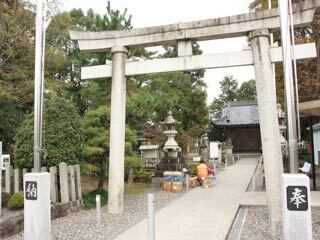 This shrine is built on the ruins of Kagano Castle which built in 1317. When you gather water, use scoop. The water passed the health examination but better to boil it before drink it. There is no parking. The well was dig in 1988 and springs 400L of water per minutes. It is 136m deep and the temperature of the water is 14 c.